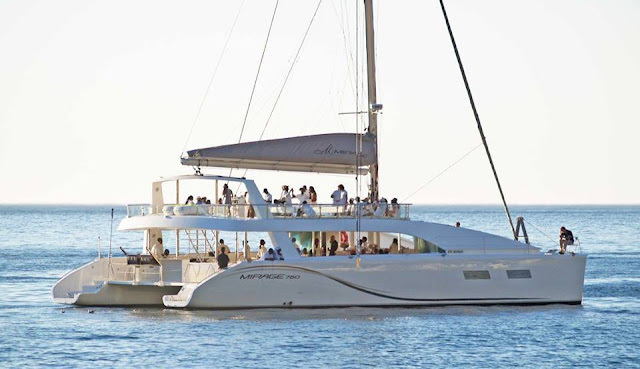 As a growing trend amongst the international jet set, yacht parties have become known for their glamour, their extravagance and their prestige, qualities we believe South Africans deserve to experience as well, in the same sumptuous style. Enter the Mirage, a custom-built private yacht designed not only to deliver the same luxurious atmosphere, but surpass it. Gourmet cuisine, five-star service, lavishly appointed surroundings, these are only the beginning. Step on board and youâll immediately see why the Mirage holds the title of being the largest and safest private yacht in the V&A Waterfront â because with a meticulously constructed, wonderfully spacious layout, and a highly trained, responsive crew to attend to your every need, youâll be able to stretch out and enjoy your sailing experience with complete peace of mind. If youâre feeling a little more adventurous, or simply want to enjoy the crisp sea air, the flybridge beckons, a perfect vantage point from which to take in unparalleled views of mountains above and dolphins below. And if youâre thirsty for more extravagance, simply make your way to the full service bar, stocked with bottled beverages, fine wines, and gourmet coffee. Cruises are subject to ideal weather conditions. All public cruises are subject to a minimum group size of 10 pax. Departure times vary according to season. This cruise is not a private cruise. This package includes a sunset cruise for two. Beverages are excluded.